Do you intend to move to Spain with your family this year, and maybe buy a property? If so, you’ll already be thinking about sitting on the beach, soaking up the sun, with a tall glass of sangria by your side. That said, before you can get working on your tan and enjoy la vida española, you’ll need to sort through some practical things and pay attention to our Currency Exchange Tips. For example, how can you transfer your money from the UK to your Spanish bank account at a top exchange rate? Well, to ensure you maximise your euro total, and start your new family life in Spain on the best foot, please find below 10 easy tips. Keep these in mind, and exchanging currencies to move to Spain will be ¡muy facil! 1. Plan your money transfer well in advance. Are you thinking about moving to Spain with your family in the next few months? If so, start looking at transferring money to your Spanish bank account now. This is because, the sooner you look at exchanging currencies, the bigger the window you give yourself for an outstanding exchange rate to become available! 2. Talk to a friendly, professional currency dealer. Is this your first time transferring a significant sum of money to Spain? If so, speak to a friendly, professional currency dealer. He or she will explain the process and answer your questions in straightforward language, without any jargon. This way, you can put your mind at ease. 3. Transfer your money with a foreign exchange broker, instead of your bank. When we transfer money to Spain, it’s tempting to use our local bank. The thing is though, the banks know this, so they offer inferior exchange rates. Instead, a foreign exchange broker can get you a significantly better currency rate, to make moving to Spain with your family a breeze. 4. Accept a good exchange rate as soon as it arises. When you exchange currencies, our impulse is often to wait and see how high the exchange rate goes. The thing is though, the foreign exchange market is highly volatile. Given this, instead of trying to “time the market”, exchange currencies when a good rate arises. This way, you’ll receive the euro total you need! 5. Keep an eye on the foreign exchange rate with Google. To keep an eye on the foreign exchange rate, and find out when sterling climbs, you can simply use Google. Just enter “GBPEUR” into the search engine, and Google will return the current exchange rate, as well as a historical exchange rate graph. This way, you can see if the exchange rate is favourable! 6. Don’t exchange currencies at the “low of the day”. On a given day, the exchange rate fluctuates. Today, for example, the pound to euro interbank exchange rate has moved almost 0.5 cents! As a result, to lift your euro total when you move to Spain, ensure you don’t exchange currencies at the “low of the day”. This is the point when the exchange rate is lowest! This means that the currency dealer will adhere to all UK regulations to transfer funds, and protect your money! 8. Avoid banks or currency brokers that charge fees or commission. In 2018, you can transfer your money to Spain while paying 0% in fees or commission. This way, you save the highest possible amount, to lift your euro total in your Spanish bank account! So, when you speak to a currency broker, ask them to confirm that they charge 0% fees and commission. 9. Get peace of mind with an International Transfer Receipt (ITR). When you transfer money abroad, you’ll like to know that your money has arrived safely in your Spanish bank account as soon as possible. To get this peace of mind, ask your foreign exchange broker for an International Transfer Receipt (ITR). With this, you’ll receive quick, clear confirmation that your money transfer has been successful. 10. Protect yourself against volatility, with a forward contract. To guarantee that you get the euro total you need when you move to Spain with your family, you can set up what’s called a forward contract. With this, you lock in today’s exchange rate, so you know well in advance what euro total you’ll receive in your Spanish bank account. This way, you’re protected against currency volatility! 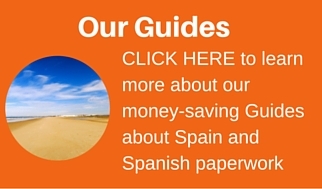 With these 10 tips in mind, transferring money for your move to Spain will be a cinch. So you’ll enjoy less stress, and more ¡siesta under el sol!